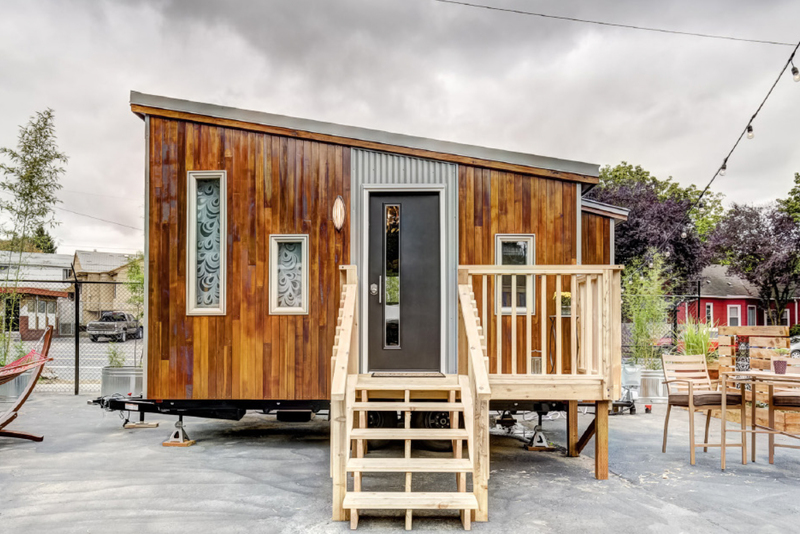 As the tiny house movement gains pace across the globe, Rob McFarland checks out some small spaces in Portland, Oregon that are big on style and fun. Once upon a time, hotels were all about lavish indulgence. They’d have giant spa baths, luxury toiletries and towering stacks of fluffy white towels. Of course, some still do, but most properties pay at least lip-service to guests’ increasing concerns about the environment. Baths have been replaced by showers; towels are no longer changed daily and toiletries are refilled rather than replaced. It’s a good start but many would argue that to really reduce your footprint you need to do something more drastic – take up less space. 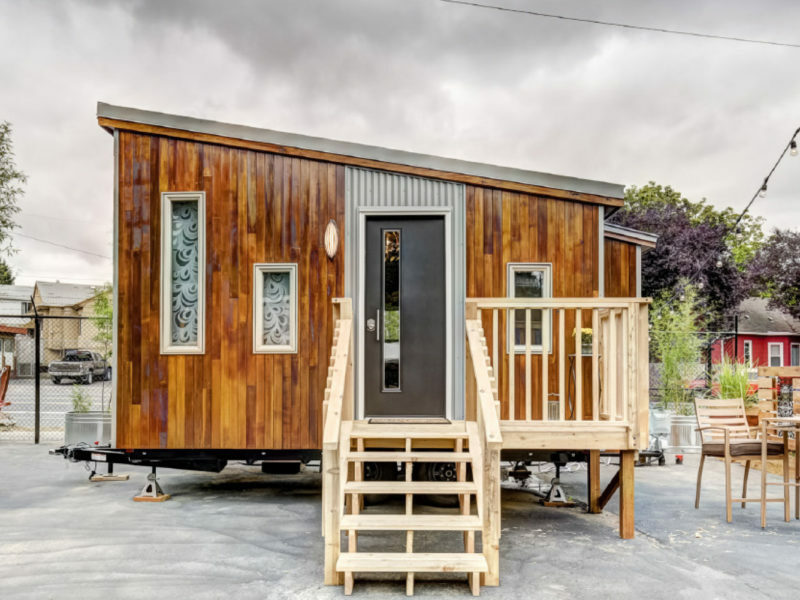 The tiny house movement has been slowly gaining momentum in the USA, with people trading in their sprawling McMansions for smaller, more eco-friendly properties. Predictably, it was only a matter of time before someone did the same with a hotel. The founders of Tiny Digs spent eight months looking for the right location for their hotel of ‘tiny houses’. Eventually they settled on an old car lot in Portland, Oregon’s vibrant Kerns neighbourhood, six kilometres east of the city centre. After launching in September 2016 with six houses, they now have eight and plan to add more. I stayed in the Cabin, which is an adorable homage to all things woody. The interior is made from tongue-and-groove cedar, the outside is covered with cedar logs and the bathroom door is fashioned from beetle-damaged pine. Miraculously, the designers have crammed a queen-size bed, a kitchenette, a dining table, a sofa (which converts into a second bed) and an en suite into a floor space of just 14 square metres. Make no mistake, it’s cosy – you wouldn’t want to throw a dance party or attempt to cook a six-course meal – but it just shows what’s possible when you apply clever design to a compact space. All but one of the houses was designed by one of the hotel’s four founders: each has a different theme and the attention to detail is utterly charming. The Gypsy Wagon (the one exception – it was purchased) is a bohemian riot of brightly coloured fabrics, the Beach is all soothing pastel blues and the Barn has a sink fashioned out of an old whisky barrel. My log cabin is decorated with suitably outdoorsy pictures of grizzly bears and rutting stags, plus there’s an eclectic reading selection that includes a tongue-in-cheek wilderness survival guide with a chapter on how to negotiate with a hippie. The houses are arranged in a semi-circle around a communal fire pit and the compound is illuminated by strings of twinkling lights. It’s a homely, welcoming set-up and guests often congregate around the fire over a drink. Of course, a hotel is only as good as its location and Tiny Digs is ideally situated one block from NE 28th Avenue, known locally as ‘restaurant row’. Within a 10-minute stroll are more than 50 restaurants and brewpubs, offering up everything from Cuban to Thai to classic American comfort food. If you want to explore further afield, there’s a Biketown rental station nearby or downtown is only a 10-minute cab ride away. To be fair, Tiny Digs wasn’t Portland’s first tiny house hotel. That honour goes to Caravan, which opened in 2013 in the Alberta Arts District. The property is still going strong, with six themed houses clustered around a cosy communal fire pit. Head an hour east of Portland and you’ll find another collection of tiny dwellings in the Mt Hood Village RV resort. From here you’re well-positioned to explore the spectacularly verdant Mount Hood National Forest. I’ll confess I was a little sceptical at the prospect of squeezing myself and my suitcase into such a compact space. But by the end of my stay I was a convert. I loved the ingenuity, the irreverent decoration and the sheer, irresistible cosiness of the place. It also made me think seriously about how much space and stuff one person really needs. Which, presumably, is the whole point. Tiny Digs Hotel 2646 NE Glisan Street, Portland. From $230 per night. Caravan 5009 NE 11th Avenue, Portland. From $220 per night. Mt Hood Tiny House Village 65000 E. Hwy 26, Welches, Oregon. From $185 per night.